Planting a shrub is a perfect way to spend some time during this spring. Get out there and do some planting! Most people who are planning landscape changes tend to focus on the garden, the grass, and the trees. Those are all very important parts to a yard. Shrubs are another important part, one that many people underestimate. If you think of shrubs and all you can imagine is your aunt’s “fence” which is really just a bunch of raggedy shrubs separating the yard from the street, think again. You’re missing out on all that shrubs have to offer for your landscaping. Shrubs don’t have to be scraggly and ugly. There are so many beautiful varieties to choose from, including shrubs that flower and shrubs that have colorful foliage. You can vary the heights of shrubs to make an interesting centerpiece to your yard, and offer visual drama by including different heights and widths among other garden features. If one of the things keeping you from enjoying the oasis that your yard could be is the lack of privacy, shrubs could be the answer. They can be grown to any height you want, to keep neighbors from leaning over the fence or to just keep people walking by from looking in. If you want privacy all year long, opt for evergreen shrubs. If you have any intention of putting your home on the market in the near future, you need to start getting your landscaping together now. Shrubs are a great way to start this process. They offer a lot of bang for your buck because they are relatively inexpensive, especially in comparison to trees, and some of them grow fast. Shrubs also compliment most existing landscaping projects, so adding them won’t upset the design you’re already working on. Tall shrubs are a great way to achieve shade in a yard, for your shade-loving gardens or for relaxing on those long summer days. But shrubs can also help shield your house from heat. If you plant tall shrubs along the south facing side of your home so that they shade the walls, windows, and any window AC units you have, you can decrease your energy bills substantially. Ready to have the beautiful yard you have always dreamed of? Harford Tree Experts & Landscaping, Inc has been in the business for decades, providing customers with quality work and quick responses all at the right price. 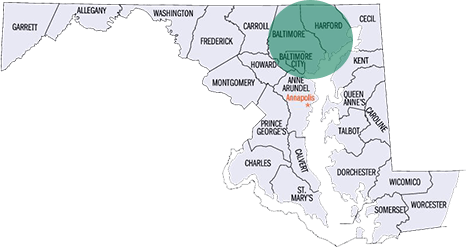 We service the areas of Harford County, Baltimore County, Baltimore City areas including Bel Air, Fallston, Perry Hall, Towson, Essex, Parkville, White Marsh and Middle River. For service during business hours, reach out to us or give us a call at 410-592-7321. We offer 24/7 emergency service as well, just give us a call at 443-250-6649. For updates about our business and more informative tips, follow us on Facebook, Twitter, and Google+. This entry was posted on Thursday, April 4th, 2019 at 3:39 pm. Both comments and pings are currently closed.